What Can I Use to Regrow Hair After Hair Loss Caused By Stress? Question: What can I use to grow my hair back? I’ve had hair loss from stress. Answer: Hi, Addison. There are many conditions which can be caused or influenced by stress. Therefore, we would need more detail as to your diagnosis in order to provide you with appropriate hair loss treatment recommendations. In order to give you a better idea as to what may be involved, here is a brief overview as to some of the key types of hair loss caused by stress and how they are commonly treated. It is also important to note that where stress is the cause or a factor, the reason behind this should also be addressed. There are two temporary hair loss conditions which can be sparked by stress – either emotional or physical – which tend to become noticeable around three months after being triggered. These are Telogen Effluvium when the condition lasts up to six months, or Chronic Telogen Effluvium, also known as Diffuse Thinning, when it lasts for a minimum of six months. They both cause thinning hair from all over the scalp, with a noticeable drop in the hair’s volume as a result of up to 30 per cent of the hairs which would otherwise have been in the active phase of the hair growth cycle prematurely entering the resting phase and falling out. Whilst these tend to be more commonly seen in women, when they are stress-related they can affect both men and women. Whilst they will generally right themselves naturally in due course, treatment and appropriate supporting products, from low level laser therapy devices to targeted food supplements, may also be beneficial. Men and women who have androgenetic alopecia, most commonly referred to as Male Pattern Baldness and Female Pattern Hair Loss, can find that stress exacerbates their condition. Where the condition is already present and is simply made worse by stress they may find their hair starts to feel drier, look more lifeless and their rate of hair fall speeds up. Whilst these forms of genetic hair loss only affect the areas along the top of the head from crown to hairline and temporal regions, they may also notice thinning hair all over their scalp. This is the result of one of the temporary conditions listed above which can occur simultaneously alongside pattern hair loss. In people with an underlying genetic predisposition to Male or Female Pattern Baldness, the onset of these conditions can be sped up by a bout of Telogen Effluvium/Chronic Telogen Effluvium. However, because these conditions affect the entire scalp diffusely, it can be difficult to tell if this is the case without having a professional consultation with a hair loss specialist. There are clinically-proven, MHRA licensed and FDA approved genetic hair loss treatments – one topical (suitable for men and women), one oral (men only) – and – a tailored approach can help to treat both conditions at once, where needed. 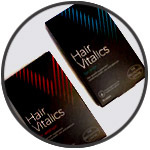 This can involve not only the established medications in the most suitable formulations, but also additional products and treatments designed to support hair growth. Extreme stress, sudden shock or trauma are known to prompt sudden hair loss from the autoimmune disorder Alopecia Areata. 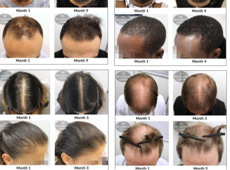 This disrupts the hair growth cycle and results in normal hair production being shut down in certain hair-bearing areas depending on the severity of the condition. In its mildest form – Alopecia Areata – it causes rounded bald spots to the scalp only, but in more extreme phenotypes it can cause baldness of the scalp or from head to toe. The scalp-only form may clear up naturally, and often does within 12 months in the majority of cases, though whether or not this will happen – or when – cannot be predicted. Alopecia Areata treatment is often possible for the scalp only version and can help to encourage hair regrowth, however, there are less options available for those where the hairloss is more extensive and those that are possible tend to be less effective. As before, given we would need more information in order to tailor our recommendations for suitable hair loss solutions to your condition, medical profile, age and personal preferences, we advise having a consultation with a specialist as the next step in your hair growth journey. 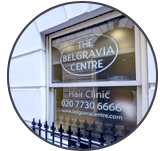 “My experience of the treatment and service at the Belgravia Centre is 100% per cent positive. I feel the results of the continuing treatment are absolutely remarkable. “Naida has been really good in explaining to me what is happening to me. She made sure I understood everything and she has also been very sympathetic, understanding my concerns and my frustration. Farzana has been really supportive and explained to me everything. She is also been really helpful and quick in replying to my emails.